Last Sunday felt like the Groundhog Day for recipes. I baked seven versions of basic butter cookie dough – again and again and again. Yep, seven, all using relatively the same ingredients – all distinctly different – and not one passed the test. Who knew finding the perfect cookie base would be so difficult? 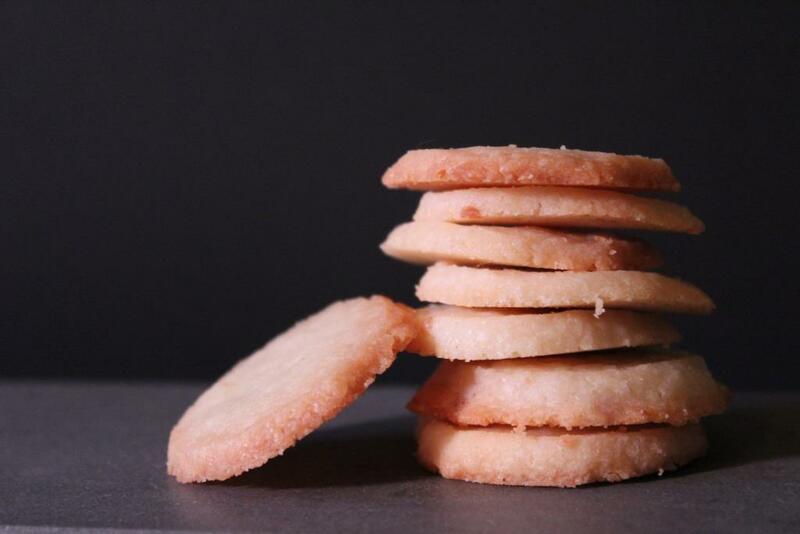 There’s a purpose to my butter cookie baking compulsion – an excellent reason, in fact. The owner of the steakhouse where I briefly worked called me unexpectedly. He wants help with his dessert menu. Me? Me! – for his 4.9 star opentable.com -rated restaurant. They are looking for a citrus dessert as well as a cookie plate, hence seven versions of basically the same cookie. Sadly, none of them hit the mark. Cookies 1-3: The cookie recipes from myrecipes.com, Taste of Home and Good Housekeeping were all similar and didn’t stand out, perhaps from my overworked flavor receptors. Good texture, but tasting like the Wonder Bread of the cookie world. Slap some canned Birthday cake frosting and sprinkle with jimmies and we have Albertson’s Lofthouse sugar cookies with the thick, super-sweet overly colorful frosting. Cookie 4: A straightforward, well-textured cookie – versatile, but with barely more flavor essence than the three above. Possible save – try with more salt and possibly substitute pastry flour for APF. This recipe was from BBC Good Food. Cookie 5: My favorite in regards to taste are these brown-sugar, crisp yet chewy delight from Cookies and Cups. These would be addicting sandwiched with a brown butter frosting or made into a nutty or chocolaty treat. Nutella sandwich cookies, anyone? I however, need The Ultimate in versatility. Nope, not going to work – but a recipe definitely worth saving. I devoured almost the entire Tupperware container of these until I felt sick. True confessions – I even shoveled a few more in my mouth after my stomach protested. Cookie 6 and re-bake 7: The recipe from Sugarywinzy has the most potential with a prominent butter taste without the limiting flavor of brown sugar. I was so hopeful this cookie would be it. It has a similar texture to the cookie from Cookies and Cups, but these cookies spread in an odd uneven manner. My first reaction was, “user error” – I didn’t allow these to firm up enough. Unfortunately, I let them set up overnight and they did the same thing the next morning. My next move was to try a hotter oven to set them up faster. Nice try, but no dice, these cookies still spread oddly. Strangely, this recipe didn’t call for any eggs, so I may give it one more try with an egg, but I’m not hopeful. Ready to fling the cookie plate across the room and move on to the citrus dessert instead, I have three more iterations to bake this weekend: Cookie 6 with egg, Cookie 4 with salt and pastry flour…and if neither of those work…the recipe in Gisslen’s Professional Baking tome, which I probably should have made first. I have a sneaking suspicion that one is going to be the winner. Miles to go before I sleep – after I finally decide on a base, I need to decide on the actual cookies. This entry was posted in Recipe and tagged butter cookie, Butter Cookies, cookie dough, Cookie Plate, cookie recipes, cookies, cooking, dessert, Dessert Menu, food, food nerd, Foodie, Groundhog Day, menu, Recipe, Steakhouse, Taste Testing by Julie "Phoren" Seyler. Bookmark the permalink.